Yay!! It’s Friday! We made it! I'm so looking forward to the weekend!! 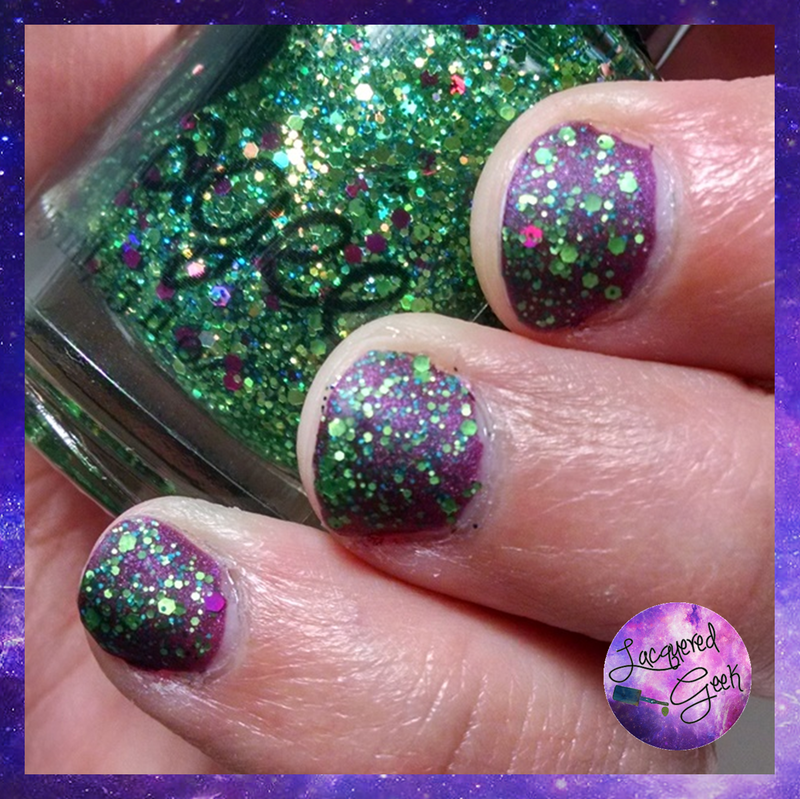 Today, I've got one of the duos from ellagee's "Villainous Holo-ween Collection to show you. ellagee’s latest collection is inspired by your favorite Disney/PIXAR villains and is just in time for Halloween! There are a whopping 16 different polishes in this collection, with 8 different duos. Each duo is made up of a fantastic holo and a coordinating glitter. I've got the Dr. Facilier duo to show you today! 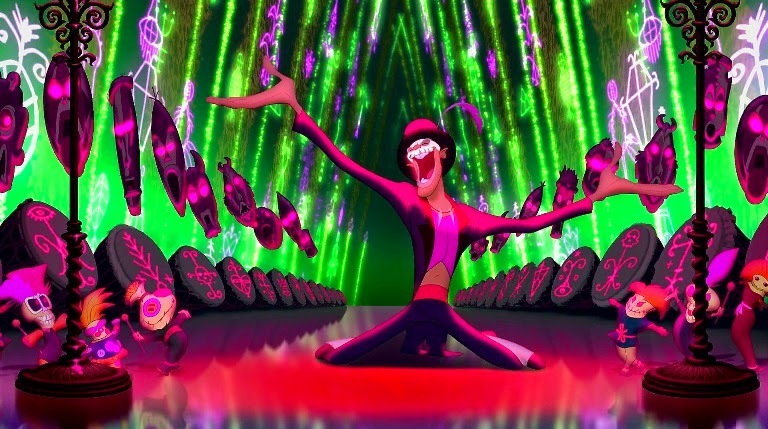 The Dr. Facilier duo was based on Dr. Facilier, the villain from The Princess and the Frog. These two polishes definitely make me think of this scary Shadow Man! “Shake A Poor Sinner’s Hand” is a red-violet holo. I did find a little on the thick side, but not so thick as to make it gloopy or unmanageable. I’m wearing 2 coats in the photos below, and no top coat. The holo is really outstanding in this polish! 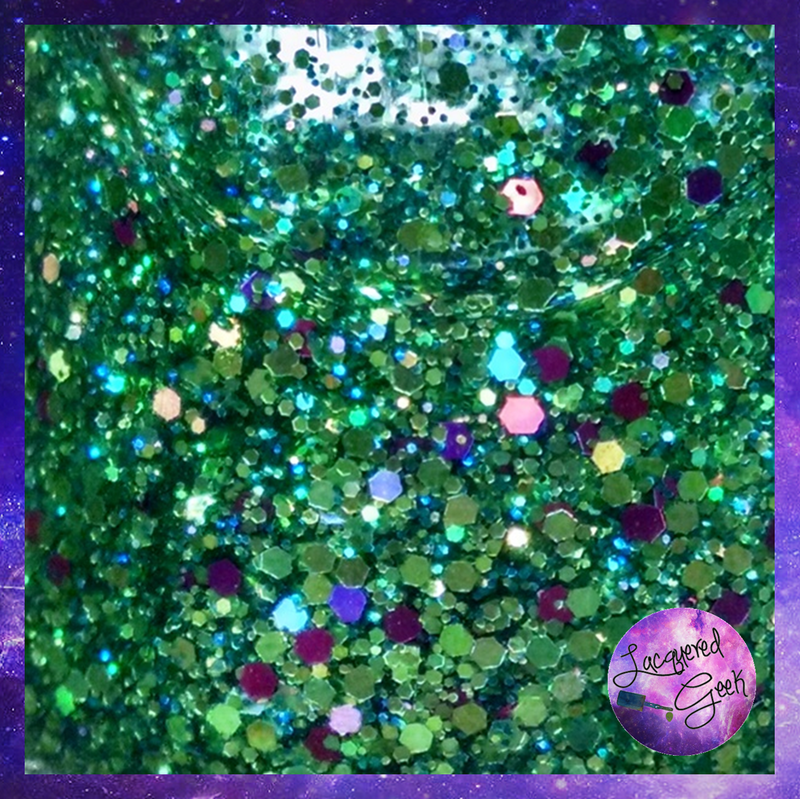 The second polish in the Dr. Facilier’s duo is “Friends On The Other Side.” Friends On The Other Side has loads of emerald and lime glitters in different sizes as well as fuchsia hex glitters in a clear base. Check out all these gorgeous glittery goodness! As I was taking the photos, I decided that I wanted to see how these two polishes looked matte, so I topped everything off with a matte top coat, and fell in love. They are sparkly on their own, but with the matte top coat, the glitters just pop! I really loved how well these polishes go together, but could be paired with others in my collection for a completely different look. The Villianous Holo-ween Collection is currently available on ellagee.com. The duos are $19.50, or you can buy the individual polish as well. The holos are $11.00, while the glitters are $9.50. Make sure that you follow her Facebook page for sneak peaks at upcoming collections, as well as pre-sale specials! Love it with the matte top coat. Beautiful duo! I do too! It really helps bring out the different shades of green.